If there were paradise on the earth, the closest thing would be Jamaica. With its lush tropical forests, pristine beaches and friendly people, most people would agree that it is truly paradise. This is why Jamaica is a popular destination for the past several years. Jamaicans form one of the largest ethnic groups in the USA with more than a million people of Jamaican decent living there. To help them stay connected to their friends and family in Jamaica, simplecall is offering an alternative to cheap calling cards for Jamaica. Our PINless calling service gives you the ability to keep in contact with your loved ones back in Jamaica. It is like an international calling card but doesn’t require you to carry a plastic card like all the other calling cards in the market. So, next time Usain bolt races, use simplecall to call home and share the experience. simplecall is about simplifying your lifestyle. 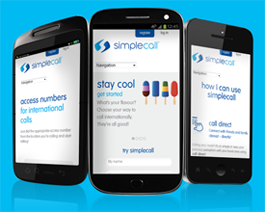 To make your international calling simple and affordable, all you need to do is take a moment and register on www.simplecall.com. Once you start using simplecall, you won't want to stop because the call quality is so good and the calling rates are so low – in fact, they start from 24.97¢ /min to landlines and mobiles.